Va Frida Kahlo de Rivera (6 Jerrey Souree, 1907 - 13 Jerrey Souree, 1954) ny pheinteyr Meksicagh. Rug ee ayns Coyoacán, Meksico, ayns 1907 as hooar eh baase 'sy vlein 1954. 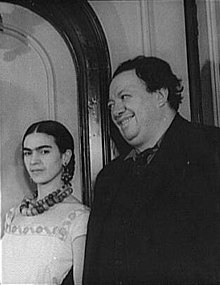 Ta tooilley coadanyn mychione Frida Kahlo ry-gheddyn ayns Wikimedia Commons.